It’s fair to say that menswear’s relationship with shearling is, well, woolly. The fabric’s air force origins and association with heroic aviators mean that shearling jackets will always have an air of flyboy cool. But then you remember John Motson. And Del Boy. And the suspicion that somebody wearing one has a dozen knock-off watches hidden inside. Cast aside the checkered history, though. Evaluate the shearling jacket today, and what you have is an unmistakably stylish and practical winter coat that pairs with more outfits than most give it credit for. Warm and tactile, it looks, feels and generally is luxury. Wealth in sheep’s clothing, if you will. Shearling jackets are crafted from costly stuff. Unlike a woolly jumper, shearling is the actual skin of a lamb or sheep with tanned suede on one side, and the treated coat left attached on the other. The process of treating it can make both leather and animal hides comically expensive, and then there’s the legwork in actually fashioning a garment out of it. It takes much longer to produce a shearling jacket than it does, say, a cotton bomber jacket, and even clothing manufacturers need to pay the bills. If cost and ecology play a part in your decision making, then it doesn’t hurt to consider an imitation. Faux shearling can look as good as the real thing and save you several hundred quid in the process, says The Guardian’s menswear fashion editor, Helen Seamons. Know that certain other touches will make for a more convincing shearling jacket, too. Seamons says that if you’re buying faux (also known as borg), you’re better off skipping the full shearling look in favour of jackets with faux shearling details, like collars or linings, which are usually better executed on the high street. “Also, just remember to keep it clean – there’s nothing worse than a ratty jacket,” she adds. Harder than finding the right jacket, however, is the outfit that sits with it. A shearling jacket is versatile, but you’d be hard pushed to call it a wardrobe staple. The most common shearling jackets are bomber and pilot’s styles, but you can also find truckers jackets, bikers and shearling overcoats. In almost all cases, the safest way to wear them is with a pair of black or indigo jeans, some rugged boots and a lightweight knit or T-shirt underneath. Monochrome is another safe approach. A shearling jacket can complete an all-black look just as well as a symphony of neutrals. It’s a statement coat – let it do the talking. Nordics know a thing or two about style. They’re also well-versed in cold weather. So, consider Acne’s shearling jacket the best of both worlds, with classic aviator versatility that’ll clinch the cost-per-wear ratio and battle the frost. Schott is to leather jackets what Heinz is to ketchup: one of the first and still one of the best. So its shearling offering is second to very few, finished to sublime quality and styled with a healthy amount of war-time Americana. A coat that should last you decades. Full shearling coats are seriously pricey, so if you can only afford ‘regular’ pricey, you should try a jacket with just a shearling collar. This one from Paris-based De Bonne Facture, with a body made from brushed-wool, will keep you cosy as we descend into the darkness of winter, and due to its tan colour will be a natural pairing for denim, making it an ideal weekend wear. Made from panels of leather and suede, and with a beautifully soft shearling collar thrown in for good measure, this Mr Porter own brand jacket is a minimal take on the classic bomber. Its simple design will ensure it can be dressed up or down – if you’re looking for a shearling jacket to wear to a smart-casual office, this could be it. The classic football pundit jacket come good. A top quality leather outer is matched by a sumptuous shearling inner – fully lined for maximum comfort – with this YMC creation. Large outer patch pockets act as the perfect hand-warmers, whether you’re cheering on your local side in the stands or not. Turns out Del Boy is en vogue again. The south London geezer’s go-to shearling overcoat was mimicked by Alexandre Mattiusi, founder of casual Parisian label Ami, on the runway, and now that’s it’s dropped online, you can own it too. Baker boy hat strongly discouraged. You can always trust Topman for an affordable and directional take on a trending menswear piece. The high street stalwart recognises that not everyone can afford two month’s rent on a jacket, so true to its ethos it’s offering the same look for (much) less. Full borg zip-up jackets have been enjoying somewhat of a renaissance since the ’90s miraculously came back into fashion. While not nearly as warm as real shearling, this pile-lined example from Uniqlo ticks all the right boxes is you fancy getting involved with the trend. Zara has form when it comes to producing affordable versions of high-fashion trends, and is especially good with tactile fabrics. So it’s not a surprise that the Spanish superbrand’s take on faux shearling is a success. This 3/4 length number comes in all black, features multiple handy pockets and is, by all accounts, as badass as outerwear gets. The Land Of The Free is also one of the best-dressed, and for that, we have Levi’s to thank. The godfather of midwestern workwear brings the same expert touch to its sherpa jacket, combining a foolproof denim shell with a comfortable faux shearling lining. The brand’s iconic trucker jacket has now been going strong for 50 years. A genuine (and affordable) classic. Decent clobber needn’t make a dent to your bank balance. River Island – the British retailer famed for affordable takes on seasonal trends – takes all the hallmarks of a sound shearling jacket, and simply makes it cheaper. Which, granted, means no genuine leather or shearling, but nobody will notice the difference anyway. What do the Spanish know about winter dressing? Well, as it turns out, quite a lot. Mango, founded in Barcelona over 30 years ago, proves an equal adversary to any northern European label, with a black faux-shearling jacket that mixes classic looks with trusty insulation. 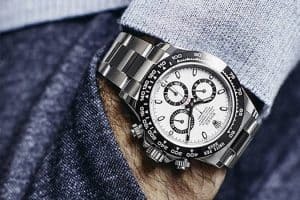 The Right Beard Length For You Plus how to grow it, style it and own it A Complete Guide To The Rolex GMT-Master II Why Rolex’s GMT is the ultimate globetrotter’s watch Football Casuals: How To Wear Terrace Fashion Want to know how hype sportswear really began?